The Tracking Board – In classic Steven Soderbergh fashion, the Oscar-winning director has shot a film in secret with The Crown star Claire Foy that is rumored to be titled UNSANE, the Tracking Board has exclusively learned. A representative for Soderbergh did not respond to multiple inquiries over the past two days, while Foy’s reps declined to comment. Plot details regarding Unsane have been hard to come by, but word on the street is that Soderbergh shot the movie on an iPhone, the same device Sean Baker used to film Tangerine. 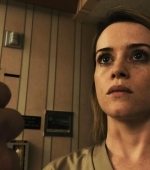 Evidently, Soderbergh took his own advice and made Unsane, which insiders say he plans to self-distribute in the U.S. through his Fingerprint Releasing banner, though he is said to be seeking international distribution. Ever since Bubble, Soderbergh has been more open to experimentation in both the production and distribution realms, so the idea that he has used his iPhone to shoot a secret movie with an up-and-coming actress isn’t as big a surprise as it might seem on the surface. In addition to directing Logan Lucky, Soderbergh recently produced WB’s female-driven summer tentpole Ocean’s Eight, and he’s currently involved in three series — The Girlfriend Experience, Godless and Mosaic. He’s represented by Anonymous Content and attorney Michael Adler. Foy won a Golden Globe for her star-making turn as Queen Elizabeth II on Netflix’s The Crown. She next stars opposite Andrew Garfield in Andy Serkis’ drama Breathe, and she’ll soon begin filming both Damien Chazelle’s First Man with Ryan Gosling, and Sony’s The Girl in the Spider’s Web. She’s repped by UTA and Independent Talent Group. With Soderbergh making the PR rounds in the coming weeks, we expect to hear more about Unsane soon, so stay tuned. Variety confirmed The Tracking Board’s article and added that Juno Temple will co-star the movie alongside Claire.